BLACK REPUBLICAN BLOG: Is Donald Trump Reaganesque? As the below article written in 2012 by Bruce Bartlett who was senior policy analyst in the Reagan White House demonstrates, if we had held Ronald Reagan accountable for his prior liberal policies and actions when he was a Democrat and even after he became a Republican, he would not have been elected and subsequently re-elected to be president. This week, former Florida Gov. Jeb Bush, heretofore a pillar of the Republican Party, both for his successful governing record and family history as son and brother of presidents, came in for criticism from members of his own party. Americans for Tax Reform president Grover Norquist, who enforces party discipline on tax issues, attacked him for being a "yokel off the bus" who was echoing Democratic talking points. 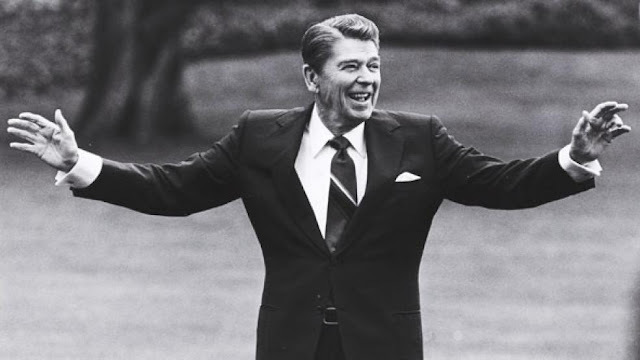 "Ronald Reagan would have, based on his record of finding accommodation, finding some degree of common ground, as would my dad - they would have a hard time if you define the Republican party - and I don't - as having an orthodoxy that doesn't allow for disagreement, doesn't allow for finding some common ground." Conservatives might have ignored Bush's apostasy except that this was the second time in two weeks that he had strayed from the reservation. On June 1, he told the House Budget Committee that he would be willing to accept a budget deal that cut spending $10 for every $1 of tax increase. The GOP party line is that taxes must not be increased by so much as a penny for any reason. Bush also denounced the so-called pledge against raising taxes that virtually every Republican has signed, noting that he never signed it. Norquist said that Bush had insulted Mitt Romney because he has taken the pledge. I think Jeb Bush has the better of this argument. It is indisputable that Reagan was vastly more moderate, at least in terms of how he actually governed, than today's GOP. At the risk of being pedantic, here is a partial list of Reagan's actions that would have him expelled for treason to conservative principles if he were running for president today. * As a Hollywood actor, Reagan had been the head of a labor union, the Screen Actors Guild, and was proud of the higher pay and benefits he negotiated for his members. As president, he praised labor unions, saying, "Collective bargaining...has played a major role in America's economic miracle. Unions represent some of the freest institutions in this land. There are few finer examples of participatory democracy to be found anywhere." * Franklin D. Roosevelt was Reagan's political hero and he voted for him for president 4 times. As president, he said, "F. D. R. was an American giant, a leader who shaped, inspired, and led our people through perilous times." * As governor of California, Reagan signed into law the largest state tax increase in history up to that time. It increased California taxes by a third, including an increase in the top income tax rate. There were other tax increases as well, which raised the top rate to 11 percent from 7 percent when he took office, a 57 percent increase. * Also as governor, Reagan signed into law California's first law permitting legal abortion - at the behest of his two most conservative advisers, Ed Meese and Lyn Nofziger. On other social issues as well, Gov. Reagan was far more progressive than his image. For example, he authorized conjugal visits for prisoners for the first time in the state and broadened environmental protection. * In 1981, Reagan proposed a large tax cut. But when deficits became a problem, he supported tax increases and signed 11 of them into law. Among them was the Tax Equity and Fiscal Responsibility Act of 1982, the largest peacetime tax increase in American history. * Reagan supported an increase in the capital gains tax to 28 percent from 20 percent as part of the Tax Reform Act of 1986. * In 1986, Reagan supported an immigration reform that gave amnesty to 3 million illegal aliens. During the 1984 election, Reagan said, "I believe in the idea of amnesty for those who have put down roots and who have lived here even though sometime back they may have entered illegally." * At the Reykjavik Summit with Soviet Premier Mikhail Gorbachev in 1986, Reagan, to the horror of his advisers, offered to abolish nuclear weapons. To their relief, Gorbachev declined the offer. For these reasons, Barack Obama has often praised Reagan. Meanwhile, Republican leaders admit that Reagan would clearly be out of step with his party and would not be able to secure its presidential nomination today. Jeb Bush is not the only one. Former Arkansas Gov. Mike Huckabee: "Ronald Reagan would have a very difficult, if not impossible time being nominated in this atmosphere of the Republican Party." Rep. Duncan Hunter (R-CA): Reagan "would never be elected today in my opinion." Other Republicans note Reagan's commitment to compromise and working with Democrats to find solutions to pressing national problems. Former chairman of the Republican National Committee Haley Barbour: "Let me make sure that one thing is clear about Ronald Reagan's Republican Party: Reagan did not demand or expect everyone to agree with him on every issue. He wasn't a purist. Some candidates are vying to be the most conservative candidate, and some voters are seeking purity in their choice. Well, in politics purity is a dead-dog loser. You need unity. And purity is the enemy of unity." Former Sen. Chuck Hagel (R-NE): "Reagan wouldn't identify with this party. There's a streak of intolerance in the Republican Party today that scares people. Intolerance is a very dangerous thing in a society because it always leads to a tragic ending. Ronald Reagan was never driven by ideology. He was a conservative but he was a practical conservative. He wanted limited government but he used government and he used it many times. And he would work with the other party." I worked for Ronald Reagan and believe he was a great president. But he was not a radical who made extravagant claims or sought to destroy government, as most Republicans appear willing to do today. He believed in conservative governance and getting things done, and if bending on principle was necessary, then so be it. I think Republicans would be better off emulating the real Ronald Reagan and less demanding rigid adherence to unachievable principles. Bruce Bartlett's columns focus on the intersection of politics and economics. The author of seven books, he worked in government for many years and was senior policy analyst in the Reagan White House.